First FDA-Approved Drug For Chagas Raises Price Concerns : Shots - Health News U.S. doctors treating Chagas disease have long wanted FDA approval for a treatment that's widely used in Latin America. But when Martin Shkreli took interest, those doctors panicked — then mobilized. The blood-sucking conenose assassin bug (Triatoma sanguisuga) is also called a "kissing bug" because of its tendency to bite human faces. It feeds on human blood and is the vector of the parasite Trypanosoma cruzi, which causes Chagas disease. The Food and Drug Administration recently approved the first U.S. treatment for childhood cases of Chagas disease — a parasite-driven illness that, over time and unless treated early, can cause serious heart problems in about a third of the people it infects. There are perhaps 300,000 cases in the U.S., according to the Centers for Disease Control and Prevention; the illness is much more common in Latin America, where it affects millions. "It's a chronic, debilitating infection that's also a killer," says Dr. Peter Hotez, dean of the National School of Tropical Medicine at Baylor College of Medicine. "People can be infected with this parasite that causes Chagas — Trypanosoma cruzi — for years or even decades, oftentimes without knowing." U.S. doctors who treat the disease have lobbied hard to get FDA approval for drug treatments that have long been sold outside the country, but have only been available in the U.S. via a special program run by the CDC. On Aug. 29 the FDA gave the global drug company Chemo Group approval to market its drug benznidazole in the U.S. The approval came via a fast-track process the agency says it uses for drugs that can be used to treat "serious conditions where there is unmet medical need." Hotez and other doctors who treat Chagas patients in the U.S. are thrilled that the drug will soon be more easily available and — they hope — at a reasonable price. But it wasn't easy. The story of how the decades-old treatment finally got approval for the U.S market is movie-worthy, with characters that include determined physicians and some of the nation's poorest residents, as well as convicted securities fraudster and former drug company CEO Martin Shkreli. Benznidazole is one of two main Chagas treatments used worldwide. The other drug is nifurtimox. Though benznidazole can cure early infections, it won't reverse the damage the parasite causes the heart or other organs. Still, it is the best of the two available options for treating Chagas, says Dr. Sheba Meymandi, a cardiologist and director of the Center of Excellence for Chagas Disease, at Olive View-UCLA Medical Center in Sylmar, Calif.
"The other drug is more toxic," Meymandi says, "and has to be taken three times a day instead of twice a day, and for three months instead of two months." Hotez says having even the narrow FDA approval for benznidazole (officially only for children ages 2 to 12, so far) will benefit patients. "It opens the door a little bit more for access, and that's a huge problem with Chagas disease," Hotez says. "If you wanted to get benznidazole, you had to go through the cumbersome process of getting approval by the CDC." 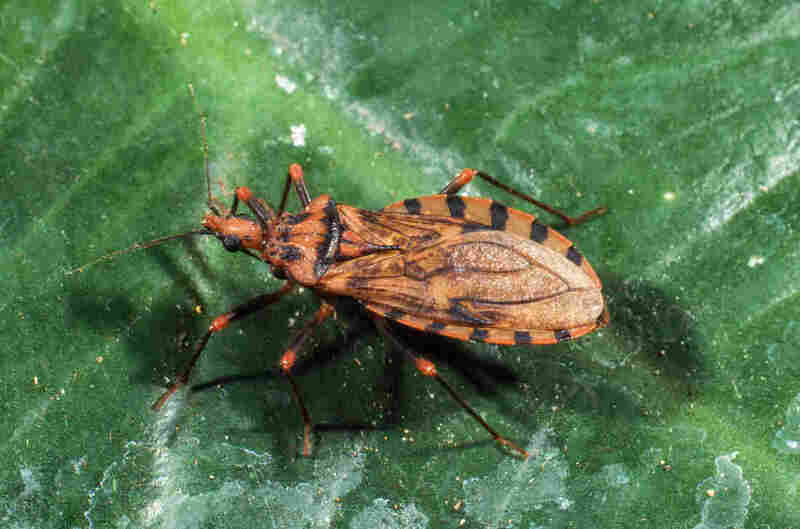 Chagas is most commonly transmitted via the bite and feces of triatomine bugs, also known as "kissing bugs" for their tendency to bite the face of a sleeping person. In Latin America, the infected bugs are mostly found in crevices of mud walls and thatched roofs of poorer adobe homes. In the United States, kissing bugs have been found in forests and foothills, researchers say — in the nests of wood rats, for example, according to one study. Dogs can be a host for the parasite, too, researchers note, though the illness is not terribly contagious. For a human to catch the illness from their dog, for instance, a triatomine bug must pick up the parasite by biting an infected dog soon after the dog's infection, then bite the person very soon after that. "We don't have kissing bugs in our homes," Texas veterinarian Sarah Hamer told NPR's Michaeleen Doucleff in 2014, "so the chance of that happening is small." The Chagas parasite can also occasionally be passed from mother to child during pregnancy, or during a blood transfusion or organ transplant, though blood donors in the U.S. are now generally screened for the parasite. Why has it taken decades for benznidazole to gain U.S. approval? It's likely that the relatively small number of people with Chagas in the U.S. didn't make the potential market seem lucrative enough for drug companies to invest in the needed testing and submit data, says Hotez. In the meantime, the CDC has been filling the gap, acting as a gatekeeper and lone supplier for Chagas drugs in the U.S. The CDC provides those two drugs (as well as five other non-FDA-approved medicines used to treat parasitic diseases) to U.S. doctors for free on a per-patient basis. The FDA approval of benznidazole won't interrupt that availability, according to Susan Montgomery, a lead epidemiologist in parasitic diseases for the CDC. Dr. Rachel Marcus, a cardiologist and medical director of the Virginia-based nonprofit Latin American Society of Chagas, says being able to soon get benznidazole more routinely, through a pharmacy, should save doctors time. But it also raises a concern for her: What will the company charge for its drug? The FDA established this priority review voucher program a decade ago as a way of spurring research and investment in the development of drugs for neglected tropical diseases and some other rare illnesses. But the former hedge fund manager turned drugmaker Martin Shkreli notoriously drew attention to the program and neglected diseases in 2015 when the company he then ran, Turing Pharmaceuticals, bought the rights to the treatment for another parasitic infection and raised its price per pill from $13 to $750. That same year, according to the New York Times, Shkreli told investors of his hope to win FDA approval — and U.S. licensing rights — for benznidazole. FDA approval would convey the exclusive right to sell the drug in the United States for at least five years — and enable Shkreli's firm to set exorbitant prices for that drug, too. "It's caused a lot of angst in the Chagas community," Meymandi told the New York Times reporter Andrew Pollack in 2015. "Everyone's in an uproar." "A nonprofit started in 2003 by physicians from Doctors Without Borders and its partners, DNDi has teamed up with pharmaceutical companies to bring seven drugs to the market for neglected diseases at low prices. In Latin America, the organization had worked with a Brazilian laboratory to manufacture a formulation of benznidazole for children infected with the kissing bug disease. As soon as DNDi staffers heard about Shkreli's plans, they went into action to try to prevent the price gouging from happening. The pharmaceutical company Chemo Group had been trying to register the drug with the FDA before the disease was even tied to the voucher. (The company's Argentinian owners also run the Mundo Sano Foundation that was started in the 1990s to combat Chagas disease.) DNDi signed an agreement with Mundo Sano. The nonprofit would provide research data while the foundation committed to putting half of any voucher profits toward programs that diagnose and treat people with Chagas. It would also produce benznidazole on a "no profit no loss" basis — meaning it would charge at or below cost to produce the drug, but no more. It was a unique agreement that accomplished many things — bringing the drug to market, capping the price, and increasing screening." "The nice thing about getting it done through a Mundo Sano-DNDi collaboration is they are nonprofits and hopefully will use that money they get to put it back into either Chagas disease research, or mechanisms to promote access to the benznidazole," Hotez says. "So they'll use it for good." Exeltis US, a subsidiary of Chemo Group, will be distributing the drug in the U.S.
Fernando Mateus, who heads Exeltis US, tells Shots he expects the cost of a full, two-month course of benznidazole to insurers will be less than $950 — and some patients with insurance might pay $50 or so for a full course of treatment. He says the company will also have a program in place to help patients who lack insurance get the drug affordably. Marcus expects many Chagas patients will need the financial help. For some of her patients, she says, almost any price would be too high, and having the CDC supply the drug has been crucial. "The most critically important thing for me is that it's free," Marcus says. "I just have to hope that they [the drug companies who sell it] will be understanding of the situation of the majority of patients with Chagas disease in this country."